In the context of the Olympics, football is hidden in a scrum of countless other sports, the Olympics is adjudged not to be the pinnacle of the sport itself, and there are no awards to honour outstanding individuals. It is for those reasons that footballers that have starred in the Olympics usually go unnoticed in the grand scheme of things. On the eve of the men’s tournament’s kick off, Salim Masoud Said profiles a few African players that struck gold at the Olympics before they really did strike gold to wider audiences. Overshadowed by the red-hot Moussa Konate at the London Olympics, but Mane, then of Metz, had the pickpocket-like evasiveness in between the lines that made him hard to contain, and one of the breakout stories of the tournament. With his willow frame and fleet-footedness Mane, the only Senegal player comfortably under 6 foot, stood out like a like a piriton tablet amongst Panadol ones, and added cunningness and aesthetic appeal on the ball to a fearsome, agricultural team. History won’t be kind to the 2012 Senegal team after their exit to Mexico in the quarter finals, but they received a standing ovation from the Wembley crowd after their 2-0 win over Uruguay despite playing with 10 men, losing centre-back Abdoulaye Ba after 33 minutes. It was their No.10 Mane’s best performance as his mesmerising runs causing constant problems to the left side of Uruguay’s defence. He would soon make a post-tournament move to Red Bull Salzburg. Fast forward four years and Mane has developed into Senegal’s key player and one of the most creative attackers in the English Premier League, sealing a move to Liverpool during the summer. 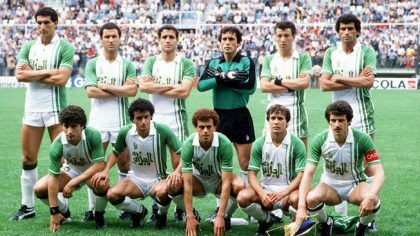 A few weeks ago, former FLN footballer Mohamed Maouch told SFG bandiera Maher Mezahi that when people celebrate the success of the 1982 Algeria World Cup side, they forget the part the 1980 Olympics played in their formation as a team. The likes of Salah Assad, Ali Fergani, Rabah Madjer and Lakhdar Belloumi were all there at the 1980 Olympics, and while all the individuals brought their own qualities it was clear who was the most talented, the one they could not do without: Belloumi. A pure playmaker, Belloumi’s goals from midfield, willingness to navigate all areas of the pitch added with the gracefulness of his ball-carrying from deep made him an invaluable asset. Shortly after finishing his national service, Belloumi was thrown into the national team, making his major tournament debut in the 1979 Mediterranean games. It was the 1980 Olympics, when he was aged 21, which would give him the global exposure and, even though he was far from entering the period of efflorescence which made him treat games like a blank canvas for his artistry, he would duly flourish. An opening goal in the 3-0 win over Syria would announce him in the first game, and he would also register on the scoresheet with a splendid equaliser in the final group game draw with Spain to pip them to the runners-up spot. It was the start of the formation of a team and the indirect designation of their protagonist. When a 16-year-old goalkeeper with no top level experience is thrust straight into the spotlight in a position that is one of the most unforgiving, or at least the most rewarding for the streetwise and life-hardened, it’s natural to expect some good, some bad and, most likely, some very ugly. The fresh-faced Kameni’s youthfulness at the Sydney Olympics was no handicap in his team’s chances to experience the ecstasy of gold as Cameroon beat Spain on penalties. Commanding, flamboyant and with the point-blank reflexes that make him unbeatable when at his optimum, a stellar Sydney Olympics saw him make the move from Kadji Sports to Le Havre and assume the goalkeepers’ gloves for the senior team from Jacques Songo’o, continuing Cameroon’s fine goalkeeping lineage. He has gone on to become one of Africa’s outstanding goalkeepers of the noughties and, currently the undisputed No.1 for Malaga, an undisputed success story in Spain where he has been plying his trade for more than a decade. If there is one major world football superpower that you can always trust to defend well, it is Italy. There are always exceptions to the rule, and their 1988 Olympics 4-0 thrashing at the hands of Zambia is a dark moment in Italy’s proud major tournament history. Indeed in Italy, they called it a shock to rival the Azzuri’s defeat to North Korea at the 1966 World Cup. This wasn’t in the day and age where there were age restrictions in the Olympics: this was as strong an Italy team as the circumstances could have allowed. Yet the Chipolopolo made an Italy team that included tough men such as Ciro Ferrari look like a glorified San Marino as Bwalya exploded emphatically onto the scene with a hat-trick. Three of those four goals came from the irresistible Kalusha; the first was a left-footed finish of raw power; the second a curled free-kick around the Italians’ wall; and then a calm finish late on to complete his hat-trick. Aged just 24 at the time, the performance was Kalusha’s magnum opus and went on to define him.